Valuable clues about an ancestor’s life are often found by locating different forms of ephemera as well as researching various categories of ephemera. Ephemera can provide a glimpse into the world of your ancestor; whether you find an old postcard, a newspaper article, a graduation program, or something as wonderful as a diary, you can instantly be transported back in time and place to experience your ancestor’s life. 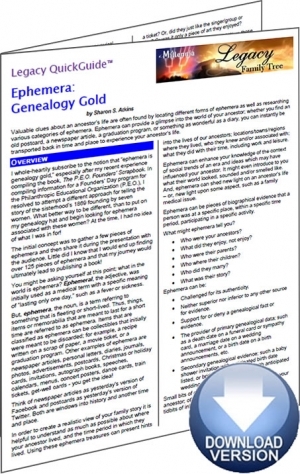 The Ephemera: Genealogy Gold Legacy QuickGuide™ contains useful information including tips and tricks, a list of different types of ephemera, terminology, and more. This handy 4-page PDF guide can be used on your computer or mobile device for anytime access.